Off-road enthusiasts, commuters, and weekend warriors alike, all rejoiced when Jeep announced their latest redesign of the Wrangler back at the 2017 Los Angeles Auto Show. 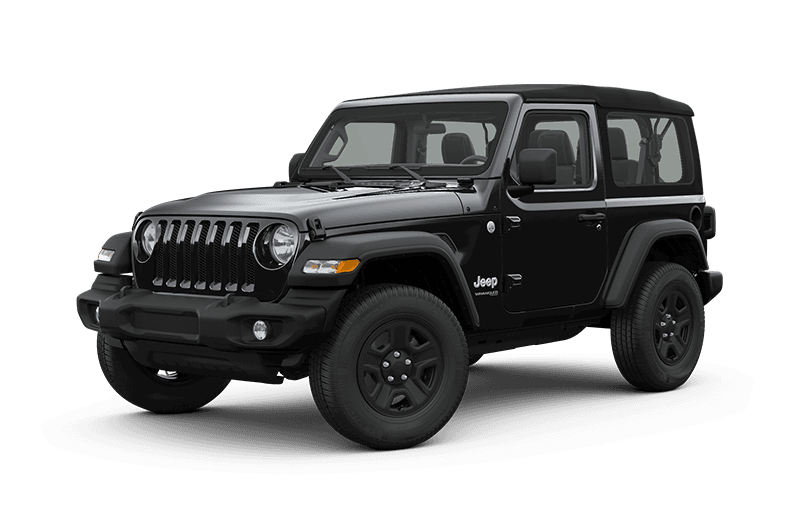 Now the current generation (JL) boasts just a few improvements for the 2019 model year that are sure to delight Jeepers. Advanced safety technology features such as adaptive cruise control and forward collision warning are now available. As is customary the 2019 Jeep Wrangler JL lineup consists of both two- and four-door models, with the two-door Wrangler offering three trims: Sport, Sport S, and Rubicon, while the four-door Wrangler offers the same three trims plus a high-tier Sahara trim. Standard under the hood of all Wrangler vehicles is a 3.6-liter Pentastar V6 engine capable of generating 285 horsepower and 260 lb-ft of torque. Additionally, the Pentastar is equipped with Fiat Chrysler Automobiles’ (FCA) latest eTorque mild-hybrid system that conserves fuel economy while the Wrangler is idling. A six-speed manual transmission is standard and yields a fuel economy of 17 mpg in the city and up to 23 mpg on the highway. An available class-exclusive eight-speed automatic transmission is also available and increased fuel economy by 1 mpg. Select trims also have the option to opt for a 2.0-liter turbocharged inline-four engine. The turbocharged engine can only be paired with the eight-speed automatic transmission while generating 270 horsepower and 295 lb-ft of torque. eTorque is available for pairing with this engine as well as it offers functions such as extended fuel shut-off, electric power assist, intelligent battery charging, and regenerative braking among other perks. A 3.0-liter EcoDiesel engine rated at 260 horsepower and a whopping 442 lb-ft of torque is slated to debut sometime later this year (2019). Intended to be off-road capable no matter the model or trim, all Wrangler vehicles feature a ground clearance of 10.9 inches, a standard crawl ratio of 2.72:1, and water fording capability up to 30 inches. Those needing towing power can opt for a package that brings the towing capacity up to 3,500 pounds. Additionally, all Wrangler vehicles are equipped with the best 4×4 systems Jeep can offer. Adventure enthusiasts looking to go off-road can rest assured that the Command-Trac 4×4 system (standard on the Sport, Sport S, and Sahara trims) with a 2.72:1 crawl ratio is capable of conquering even the roughest terrain. Standard on the Rubicon, the Wrangler lineup starlet, is the Rock-Trac 4×4 system with a “4LO” ratio of 4:1, with Tru-Lok differentials, skid plates, and front and rear tow hooks. 17-inch off-road wheels and rear steel heavy-duty off-road winch-ready bumpers are also available. Even though the Wrangler was just redesigned, the iconic and heritage style remains intact. Improvements in aerodynamics come from an overall weight reduction of 200 pounds – the hood, doors, and windshield frame are now made of a lightweight, heavy-duty aluminum and steel strength. Additionally, the top of the iconic grille is swept back to improve aerodynamics as well to soften the Wrangler’s rugged wide stance. LED headlamps, LED turn signals, and LED taillamps are available on the Sahara and Rubicon trims. The most innovative feature introduced by Jeep is the Sky One-Touch powertop that’s able to retract the full length of the roof with the simple push of a button, just like a convertible. Unlike convertibles, this power soft top is able to function even while driving at 60 mph. An all-new premium Sunrider soft top does away with the traditional window and back windshield zippers and replaces the joints with a sliding track mechanism for easy removal and retrieval. The hardtop still comes in three pieces including the removable freedom panels, but unlike it predecessor, this hardtop offers new and improved latches that make hardtop removal faster than before. Inside the cabin, the 2019 Jeep Wrangler remains true to its rugged style, but this time with much more comfort and high-quality materials. Within reach of front-seat passengers, the Wrangler offers a center stack with functional features such as climate and volume control knobs, connectivity ports, and an Engine Stop-Start (ESS) button. Standard cabin upholstery is cloth, but leather-contoured seats are available on the higher-tier trims like the Sahara and Rubicon. Comfort features such as heated front seats, a heated steering wheel, and automatic climate control are all available as upgrades. A 7-inch touchscreen display lets drivers configure information in more than 100 ways, while the controls for audio, voice, and cruise control are mounted on the steering wheel for easy use. The inside of the Wrangler is water-resistant, so drivers don’t have to worry about damage if they get caught in a drizzle with the top off, or if they need to hose out the interior after an exceptionally adventurous off-road trip. The SUV is equipped with drain plugs should owners choose to do this. The 2019 Wrangler comes equipped with a 5-inch touchscreen display with the Uconnect 4 infotainment system, an eight-speaker audio system, USB and auxiliary ports, a 115-volt power outlet, and Bluetooth voice command features. Higher-tier trims offer a 7- or 8.4-inch touchscreen display with an upgraded Uconnect infotainment system, available navigation, Sirius XM satellite radio, a Wi-Fi hotspot, Apple CarPlay, and Google Android Auto capabilities, and an available Alpine audio system complete with a subwoofer. Jeep states that the Wrangler has over 75 advanced safety features which include standard multistage advanced airbags, traction, and stability control systems, blind-spot monitoring, rear cross path detection, and a Parkview rear backup camera with dynamic gridlines. New for 2019 is the availability of adaptive cruise control and forward collision warning. All Jeep vehicles are covered by a basic 3-year/36,000 mile warranty, a 5-year/60,000 mile powertrain warranty, roadside assistance for 5 years or 100,000 miles, and rust-through coverage for 5 years or 100,000 miles. The 2019 Jeep Wrangler has a starting MSRP of $28,045 (plus destination fee).